The most ideal amplifier is always been written as a 'straight wire with gain'. A straight wire that amplifies. But in our audio world something like that dose not exist. We are always confronted with components that 'add' something to sound or take something away. In most worst situations we see both phenomenon's occur beside each other. An audio chain is build together with various parts, the source, the cables, amplifier, and again cables and than the loudspeakers. In the meantime are friend and enemy agreeing that cables must be seen as a component and that they have a certain influence on the total result in the audio chain. In many situations we are not capable to show why a cable can have so much influence. But what we know is which fundamental behavior a cable must have to be able to function correctly. And sometimes someone goes a step further. The people at SEEC know what kind of materials to use to produce a good but mainly neutral (very low colored) cable that can be connected between source and amplifier or between pre and power-amplifier. There is more then a choice of materials only. In the professional world are impedance related problems solved by a standard. All equipment fulfil to this norm and cables are matched to it. Where needed are transformers used on a line level. In the non professional world is it flatly spoken a mess with impedance's. One day industry discovered that a low output impedance and a high input impedance gives little problems and build further on this standard. That looked good, but it is not. We make a similar comparison with computer technology. You probably know the expression Ethernet. This is a normed connection-system to connect computers able to talk to each other. For the introduction of twisted pair connections was coax cable used as the medium with a specific impedance of 50 Ohm. The source and the receiver are exactly matched with each other with that impedance and that is the way how man makes the so called transmission-line through which the data moves. If we would not do this than (gentlemen system-controllers that forget to connect the resistor know what I'm talking about) than computers have a big problem to exchange data. Retransmission (sending data again) is constant necessary and data is getting slower and slower. In audio is retransmission not really possible and do we have to work with the original signal. This audio signal is along the way harmed with phase-shifting, reflections and other bad stuff. Phase-shifting occurs when voltage and current are shifted in time toward each other. Depending on frequency shall, the highest/maximum point in the signal-voltage being reached will be a fractional of a second different when the current has reached its maximum value. Caused by induction and capacities. There is also a second couse for phase-sifting and smearing the so called reflections. If a signal source with a low impedance is trying to drive a signal to a high impedance (input) then will be a part of the signal being reflected to the source. This reflected signal has nothing to do with the original signal and is on top of that also an incalculateable signal in all systems. Even various cable-length will and shall differ. This signal is dancing between source and receiver. SEEC has invented a solution for this problem. SEEC makes use of a high performance amplifier in the signal-path between source and amplifier, that is capable to deliver the power of which normal driven amplifiers are lacking. With a matched impedance they make a full scale transmission line. An absolute must is than the electronics, connectors and cables are matched with each other with the same characteristics. For the people who makes a choice for SEEC chooses for a system and not only for a piece of cable and an enclosure with electronics. An extra advantage of this system is that the output-cables may be 10 meters. Mind you that SEEC is capable to line-up the signal-transmission over this length which is hard for compatitors to do. 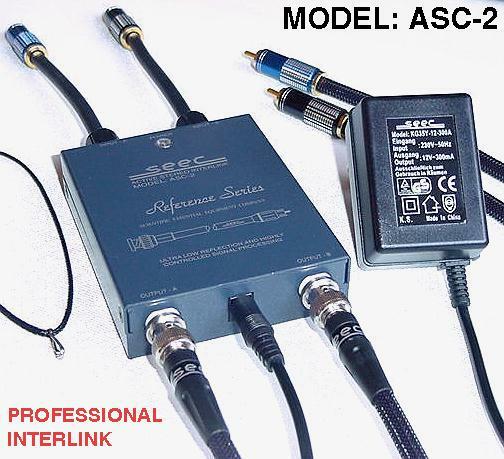 You can now put the power-amps close to the loudpreakers with very short loudpeaker-cables while connection pre-amplifier/power-amplifiers is long without harming the high quality audio-signal. SEEC makes use of short cables between source and own electronics. These cables are tightly connected to be compatible with connectors on source equipment. Behind the module are BNC connectors located to connect the output cables that may/can vary in length (standard length is 1.0 meter). The electronic module is equipped with 1 : 1 amplifiers that have no other function then the elimination of reflections, adjusting the impedance and to get rid of phasing-shifting problems. The design works with shielded dual mono amplifiers with a frequency response between 2.0 - 1.25 MHz. Within -3dB. The distortion is neglectable. The slew rate is fast and will easy reach > 20 Volt/Microsecond. The power-supply comes from a stand alone adapter to eliminate hum and noise. The level of the output signal is exactly equal to that from the input signal. The cable / electronics itself do not amplify. The by SEEC's measurements reached out to us show an absolute unharmed signal, independent from the used source. To look if the SEEC indeed functions with all sorts of equipment we have made use of two CD players, a NAD s500I Silver Line and a Sugden Masterclass. Besides that a M-Audio d/a converter. The amplifiers were Musical Technology M270 integrated amplifier and a Clear Audio Balance pre-amplifier with Monarchy Audio Class A mono power-amps. The used loudspeakers were JMLab type Electra 926 and from Mordant Short, model MS902 and MS912, connected with Siltech LS-110 Classic cable. In all cases while testing they are compared with normal going interconnects from TAF, Siltech and Linn. We took care that the SEEC system is only used as recommended as the way it comes. So I was not starting to gather cables with the proper connecting plugs and see how performed could be influenced and so on. Partly was our test-system connected to an AC filters, and partly on a separate audio-group. The cables were approximately 6 weeks in use within various configurations in order to be able to judge properly and loose from some means that are sometimes known and not known. What struck me with the ASC-2 is the way I had to get used to it and that the listener must get too in order to judge on its value. "Get used to it" I hear you say? "Why, dose the cable color?" No, explicitly not, it is about the most neutral and colorless cable I have ever heard and functioning in my system. And that is something new. Up till now I'm used to work with cable that in one way or another reacted with sound. The sound is/gets sharper, rounder, deeper, flatter with more or less low's, more transparent or just blocked, more dynamics and with more or less three dimensional experiences. The ASC-2 seems absolutely not to care about all these effects and operates as a "straight wire" with zero gain over the full audio spectrum. This is very confusing in the beginning. Understand that also my brain and ears are used to a certain sound that I experience as natural and with an ease. Coloration is ofcourse a part of that. The size in what we feel and what is nice, comfortable and natural experience are directly connected with this experience, learned impressions getting over time we call for the best of it to get mature and being broad up with it over time. Who is like me and lives in his 5th decenium has an amount of luggage and as predjedis we are that you can not just put away. And mind you, every reviewer has its own way or example. It would be to easy for me to look to other reviews I wrote and where in the ASC-2 is used. Therefor I like to grab to impression I have had with this cable/interconnect by sometimes to relate to the equipment and sometimes not. Because again this cable is unbelievable neutral, I'm missing all coloration build up over the years. In each set-up. A not known experience was in the combination with the NAD and with Musical Technology. Here I enjoyed the music with a full three-dimensional picture that was without the SEEC cable impossible to reach no matter in what combination it was plugged in. The Moudrant Short MS902 and MS912 were now very easy to be compared with each other in the stereo picture. Now both models showed very easy how they were tuned and why the MS902 cost 60 Euro's per cabinet less. Was it caused by the source, the amplifier or the cables, for me I could not care less, but only the SEEC did what was expected. A second example. The Sugden CD player connected to the Clear Audio pre-amplifier. Here I reached a neutral and transparent sound so that a couple of visitors moved to the edge of their seats. The low frequencies are extra ordinary in quality ultimately controlled and uncolored again. Not put in any way. The highs are rich/sprinkle and showed fantastic details. The midrange where voices are so important is clean and clear and loop on. The Sugden is very good, but this result is stunishing. By a lack on added sound, and thus coloration, it seems that the cable is doll and not dynamic. How different will it be when we take of the ASC-2 and put another cable in place. Than you notice how often you listen to characters that are not on the CD but are somewhere generated. I don't want to go so far that I will put SEEC in the opposite of other brands, because they all have good things, also SEEC, but the time and the research that was put in to come to the design of the ASC-2 can be roomy awarded. If you speak about the ASC-2 keep it on freedom of coloration. Freedom of coloration is mend as a compliment. This cable/product has proven in the last 6 weeks to be an all rounder that is capable to connect music and equipment from all sorts together easy. Without taking a step back I would recommend to all shoppers and retailers this product that want to make a so neutral as possible demo for there customers. And to listeners that have chosen a set that dose not require cables to tune the sound. The, by me, tested ASC-2 leaves a special impression. An impression that leaves no impression because the SEEC has no Impression. With this cryptic description I would like to say only that I have been listening to the equipment around the ASC-2. Yes again, I have gained extra life experience.